The EV5650 is a Handheld Digital Microscope from SMTMAX that is capable of magnifying 20x to 200x. It has 1.3 Mega Pixels CMOS, and a manual focus from 10 mm. 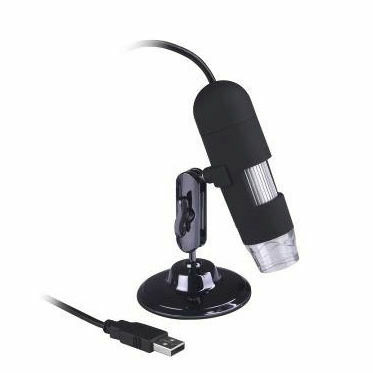 This microscope is suitable for examining solid objects such as coins, stamps, rocks, relics, insects, plants, skin, gems, circuit boards, various materials, etc. It has a metal stand included for providing a sturdy hold for in any position for viewing and/or imaging. It has an automatic white balance and exposure adjustment. The user is also allowed to examine specimen slides at low and high powers on a computer screen and it enables the user to take snapshot images or short videos. It is delivered with an Photo management software that can run using Microsoft Windows XP and Vista in order to observe the magnified images or capture video or take snapshots.